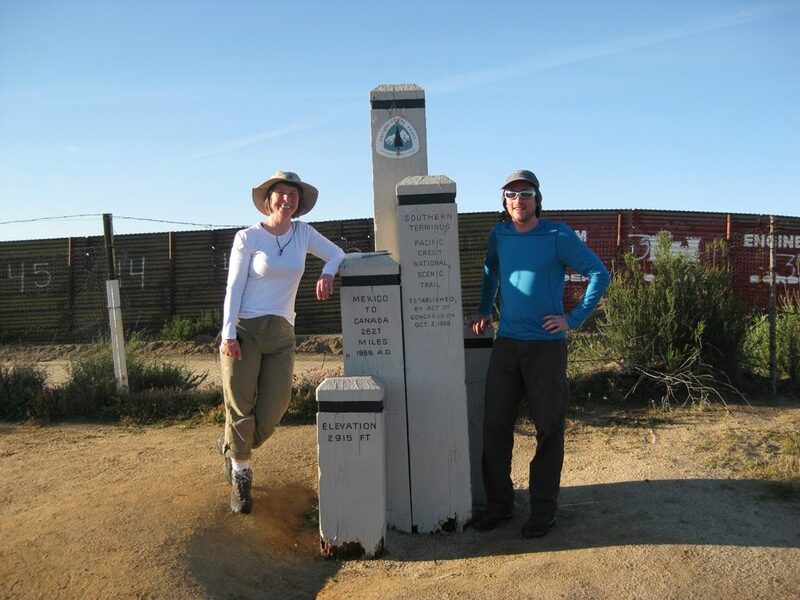 Set off north from Campo by the Mexican border fence last Monday. It’s been a very hard 10 days! and a steep learning curve too. It’s our first experience of hiking in a desert, and its been HOT, damn hot! We’ve been told it’s been 100 degrees Fahrenheit and it certainly felt it. We made the big mistake of wearing our tried and tested Scarpa boots for the first 100 miles, with boiled and blistered feet as a result. They have now been swapped for lighter boots (Patagonia Drifters) and our feet are starting to recover. We’ve been amazed at how diverse the scenery has been – from hot dry desert with cacti and snakes, to tall pine forest with snow patches and cool clean mountain air, and back again in a day! Also lush meadows, huge old oak trees, leafy canyons, sun baked chaparral, and granite boulder fields. The trail is brilliantly constructed, mostly very good underfoot and with a good even gradient, which makes for good steady walking. Not too many wildlife encounters so far, thank goodness. 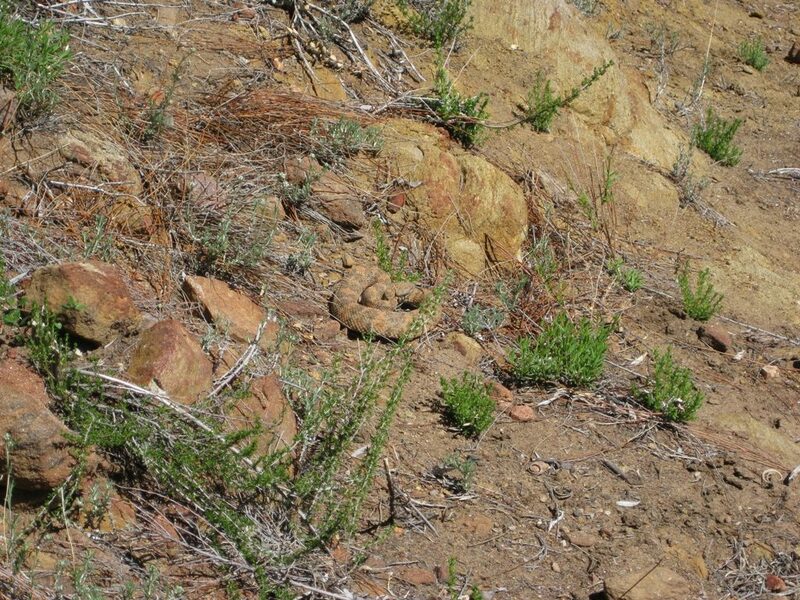 Though our first meeting with a rattlesnake was a way-too-close encounter for my liking! I was walking about 10 metres behind Neil as usual, when I heard a shout, looked up and saw a load of coils tumbling down the slope above the trail towards Neil. Neil leaped forward as the snake fell on the path between us, rattling away. After whipping out my camera for some photos, I then had the problem of how to get past it! Shouting and stamping made no impression, so Neil started throwing rocks towards it. Still no result, just lots more rattling, until a rock actually fell on to it and it retreated behind a rock about 2 metres off the trail, and I sprinted past and away. Sadly the snake didn’t accept its defeat graciously, and rattled at the next 3 hikers who walked past, as we found out later that day. We had to apologise for putting him in such a foul mood. Other hikers out on the trail at night have reported sighting big cats on the prowl along the trail, but we’ve not seen one yet – and we’re quite happy for it to stay that way! 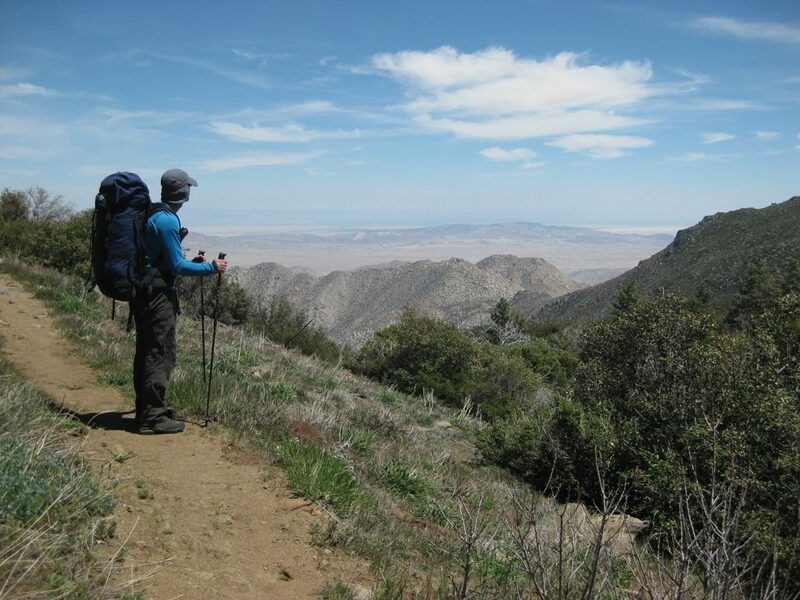 Currently having a couple of days off in Idyllwild waiting for a storm to pass, before heading up into the San Jacinto mountains with our ice axes and crampons – looking forward to it. Sounds like you've got off to a good start! I guess it's always good to get the first rattlesnake encounter out of the way… Enjoy Idyllwild and have fun in the San Jacinto mountains. Btw, still cold & rainy here.